Whether a homeowner is highly or hardly skilled, most can do modest installations. The perspective of how easily a product can be put together is sometimes deceiving. 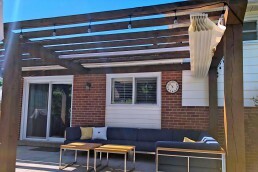 Some will stare at a retractable canopy and think it’s going to take a lot of time and energy. Generally speaking, homeowners are quite surprised at how quickly a ShadeFX system can be installed. A North York yard included a raised patio with an attached pergola. The structure provides the feeling of entering a new space with an open concept. 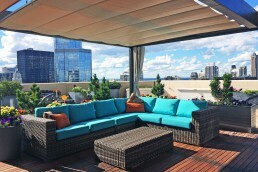 The soft furniture and pillows emphasize a relaxing environment. 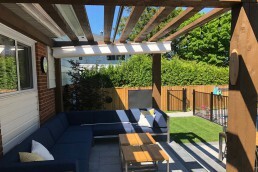 On those inclement or blazing days, the space becomes impracticable. 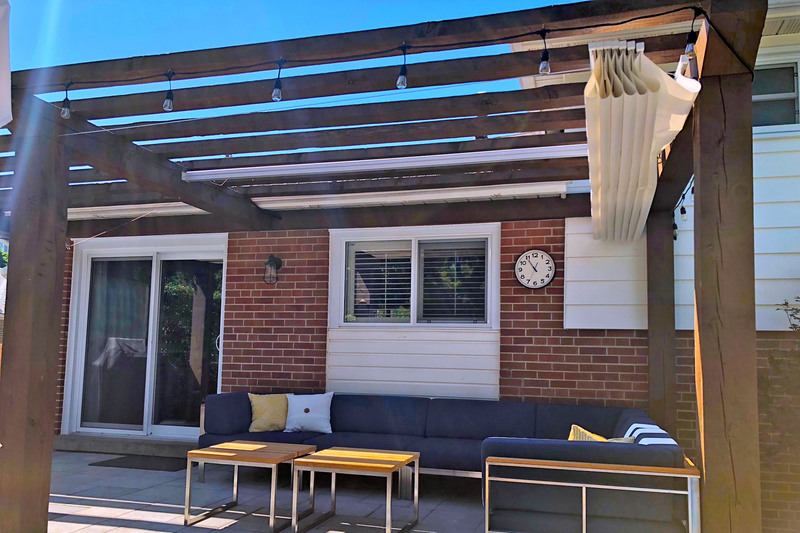 Desiring to add overhead coverage and extend the outdoor space’s usability, these homeowners benefited from a retractable canopy. Homeowner Adam Colpitts communicated with a Product Specialist regarding his requirements for the best possible shade solution. 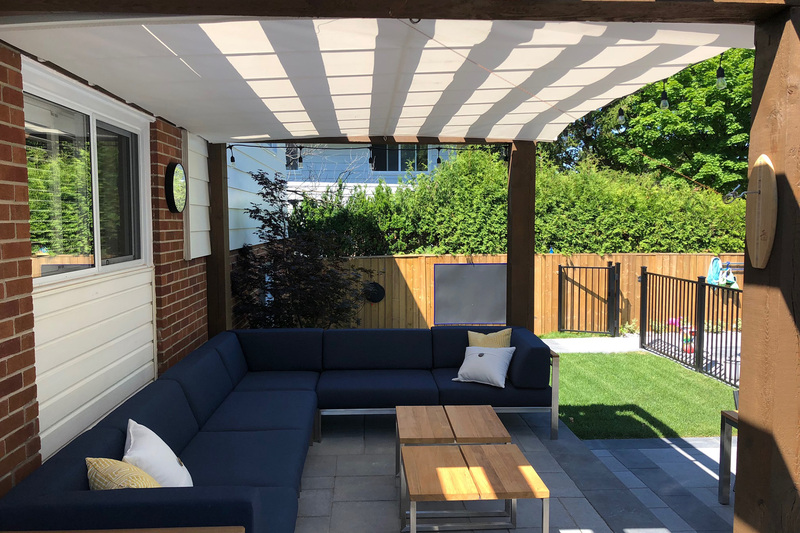 Adam installed a 12’ x 10’ manually operated canopy using Harbor-Time Alpine White fabric to his pergola, beautifully adding contrast to the overall space. Minor or major, home improvements are on everyone’s list. At first sight, an innovative product may slow down homeowners from moving forward with self-installation. 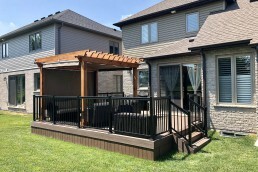 However, with an easy step by step guide, there is no need to call a specialty contractor to install a ShadeFX retractable canopy. Watch our installation video to see how it’s done. 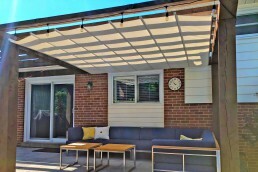 ShadeFX customized a 12’ x 10’ manual retractable shade. 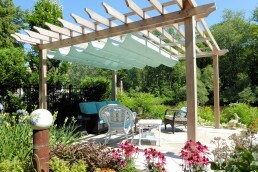 With simple instructions, the homeowner easily installed the Harbor-Time canopy creating a more enjoyable space.